5★★★★★ - "We had an excellent experience with the people of Dream Baths. They were professional and polite. We could not have asked for a better crew to do the remodel. The Master Bath turned out great. Met all our expectations. If you are in the Auburn area, feel free to contact Charlie to arrange an appointment to see for yourself. War Eagle!" 5★★★★★ - "We are very happy with the bathroom. Charlie, Jr. and Mike did a wonderful job. They were very professional. Left everything clean every day and removed all trash. I would highly recommend Dream Bath of Alabama." 5★★★★★ - "Dream Baths of Alabama did an outstanding job on our guest bathroom renovation. They made quick work of the job (only 2 or 3 days!!) to our complete satisfaction. In addition, they were very professional, friendly & neat (Cleaned up every day!). The transformation from an outdated metal tub to an acrylic one is phenomenal! We highly recommend them to anyone." 4★★★★☆ - "My husband and I pleased with the job that was done. The friendliness and professionalism was exceptional. We are just in awe of the complete transformation and would recommend Charlie and his crew to anyone we know that needs their bathroom redone." 5★★★★★ - "Julius and I were amazed at how things came together in such a short amount of time. Goes to show that these guys don’t just sit around on the job. It was a pleasure having your company do our bathroom for us. If anyone we know needs to have a bathroom done, we’ll be sure to recommend you guys. Thanks so much for all your help, patience, and professionalism. Stay blessed!" 5★★★★★ - "Dream Baths, Charlie was easy to talk to, he explained everything they were going to do in detail, and made it very understandable. The men that came to do the work , Charlie and Mike, showed up when they said they would, picked up after themselves each day and kept things as neat as possible in a remodel site,a job well done. The wife and I well pleased with the work done and absolutely love the way it turned out. We would recommend that you give them a call if you have bathroom remodel planned." 5★★★★★ - "Charlie and his crew did a great job our shower installation and really made the extra effort to make sure we were satisfied and comfortable with the project. All work was done in a timely manner with a minimum of inconvenience. Materials were all of superior quality and pricing was very competitive"
5★★★★★ - "From the very moment I contacted Charlie regarding my mom and dad's bathroom, he made me feel at ease. Being in Texas and my parents in Northport, AL was a little stressful trying to plan it all but he was able to answer all questions and advise promptly.! Charlie went and visited with my parents and looked over the situation and made them feel comfortable. Truly answer to my prayers. They had estimated 6 days but ended up being 3 1/2 days. Total blessing! Charlie, Jr and another employee came and did a great professional job. Tore out their tub which was put in the house in the 1950s and put in a beautiful shower. They needed to have better access without risking injury and this has made their small bathroom look so nice. They also installed a new pedestal sink and new flooring which brightened the room and gave more space. They cleaned up so nicely. My parents are thrilled and very thankful. Thank you so much Charlie and all !!" 5★★★★★ - "I have really bad arthritis in my back and the relief the walk-in tub has given me has brought me to tears. If I could live in it I would. I just wanted to thank Charlie and the boys for the Great work actually they did and how they helped me do some extra little things.. I was very Thankful for that." 5★★★★★ - "The experience we had with Dream Baths was top notch. From the beginning to the end of the install. Very professional and pleasant to work with and we love our shower"
5★★★★★ - "I want to thank you for the great job done on my bathroom. Please share with your website. The gentlemen who remodeled my bathroom were of the highest quality both in their actions and professionally. The work was excellent and the results are beautiful. I was on vacation when they remodeled and they are trustworthy to take care of your home while you are away. Thank you, Mr. Thornton, and tell your crew how much I appreciate all they did and Merry Christmas!" 5★★★★★ - "This is the second bath remodel by Dream Baths. They are professional and pay attention to detail. They do their best to keep the disruption of remodeling to a minimum and make sure everything is cleaned up upon project completion. I'm very satisfied in all respects." 5★★★★★ - "We are delighted with the results of our 2nd bathroom makeover! Happy to have competent and reliable service throughout the entire process! Until next time, Blessings to you and yours!" 5★★★★★ - "We want to start by thanking God and everyone at Dream Baths of Alabama for giving us our Dream Bath! Because we had a bad previous remodel experience, we contacted a number of companies. From the initial call, owner Charlie Thornton was by far the most informative, thorough and responsive contractor. Mr. Thornton's quote for our bathroom remodel turned out to be the most affordable, even with a walk-n tub option, which the other companies could not even offer. Dream Baths of Alabama installers Charlie Jr. and Mike were super professional, experienced, and efficient, answering all questions and cleaning up every day before leaving. We are extremely satisfied with our new master bathroom. We would highly recommend Dream Baths of Alabama to anyone who wishes to have an affordable dream bathroom of their own!" 5★★★★★ - "Dream Baths is amazing!! Mr. Charlie came out right away and gave us a great estimate, stayed in contact with me the entire time and had all this wrapped up in a 2 week time. They tore out my grandmothers cast iron tub that was so hard for her to get in and out of at the age of 86. 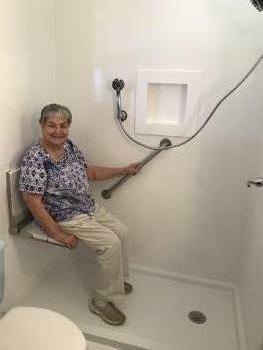 Her new walk-in shower is amazing and so much easier for her! She loves it! The workers completed this is 2 days which is great! They worked hard and quick and did a great job! I would recommend Dream baths to everyone who wants an honest hard working company that doesn’t break the bank!" 5★★★★★ - "A very enjoyable experience. They showed up when they said they would. Estimated about 2 weeks for the work. They were through in a week and a half. Cleaned up work area daily. Very impressed with their work ethic and attitude. Would definitely recommend them to anyone. Quality work at a great price. Thank you, Charlie, Charlie Jr, and Mike." 5★★★★★ - "Dream Baths does absolutely outstanding work. The workmanship, attention to detail, and experience in the bath business is obvious. We went from a useless tub to one which will be used more in one month than our old one had in 10 years. We couldn’t be more satisfied with every aspect of this project from the initial consultation to the follow up after completion. Charlie, Jr is a real craftsman!! A wonderful walk-in tub with a superbly beautiful finished bath area. Thank you to each member of this team; we could not be more satisfied with the results." 5★★★★★ - "Dream Baths of Alabama did an outstanding job on our bathroom remodel. They did the work they promised to do plus a lot more to make the bathroom look brand new. We had peeling paint on the ceiling, which they completely stripped and painted. They also painted the walls and door and medicine cabinet to make everything look new. Everything was cleaned up well when they were finished. We would highly recommend anyone needing a bathroom remodel to call Charlie Thornton. Him and his team will take really good care of you." 5★★★★★ - "Dream Baths remodeled my hall bathroom. I am so thankful for the beautiful work they did. From the very first time Charlie came out to look at the potential project, he explained everything and let me know what to expect for the whole process. Throughout the time prior to the project and through the project Charlie was always reachable and answered every question. The guys who worked on the remodel did a fantastic job and were always respectful and courteous of my family and my property. When you step into the new bathroom you feel like you are somewhere else. I would certainly recommend Charlie and the guys to anyone and I will use them again to remodel my other bathroom down the road. I cannot say enough how glad that I am that I chose them for this remodel." 5★★★★★ - "The Dream Bath team showed up on time and went to work on our bathroom immediately. They were knowledgeable and professional and always cleaned up after each day. They finished the project on time as anticipated. Dream Baths of Alabama turned our 1980 master bathroom into a sleek 2018 master dream bathroom. So, if you want to remodel your bath, give Dream Baths of Alabama a call for an estimate." 5★★★★★ - "I would like to take this opportunity to express my appreciation and gratitude for a job well done and that exceeded my expectations and as you must know by now ( I have relatively high expectations). 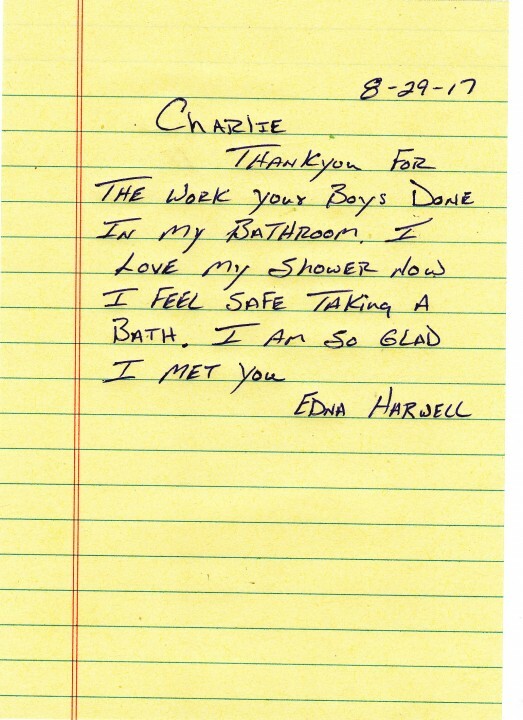 Charlie, you and your wonderful workers were always, considerate, professional, attentive to all details both big and small and gave me a beautiful bathroom that I love to use and show off. At a time when I was doing many renovations at the same time, it was Dream Baths of Alabama that I could count on to show up, clean up and provide expert craftsmanship at a competitive and fair price. I know this because I did my 'homework' and had received more than one other quote before going with Dreams Baths of Alabama and I am so very glad I did!" 5★★★★★ - "The Guys with Dream Baths done a great job. They converted a tub to a shower for me and I am so happy that now I can take a bath without worrying about falling or slipping. The guys that did the work were really nice and Charlie the owner has checked back with me just to see how I am doing I like that. 5★★★★★ - "We are very happy with how it looks and we are content with our water pressure. Thank you and your crew for all the great work!! Sorry for the headaches, I was just trying to get the best possible results from this awesome project. Thank you again." 5★★★★★ - "We were just talking about how kind and fair of a person you are and how we really appreciate the wonderful work, advise and information you have given us. It must run in the family because both Charlie Jr. and Steve were so pleasant and kind to work with. Steve did an absolutely wonderful job today. Such a really great guy! Alabama Dream Bath is at least a 6 out of 5-star rating! David is coming next Thursday to start on the plumbing for the utility sink in the garage area. Charlie it has been an absolute pleasure working with a person of your caliber, integrity, and kindness. 5★★★★★ - "The guys did a great job and it looks fantastic. I can’t wait to try it out, and it’s not even my bathroom! Thanks"
5★★★★★ - "Charlie, Thank-you for your leadership today. It was NOT your fault that the faucet problem occurred; however, you took ownership of the problem and took appropriate action. Most would have asked the customer to play the role of "bad-guy" to put the pressure on. I cannot thank-you enough for the way you took charge of the situation and found a way to "get-r-done." We love our new bathroom and every time I walk in there I will think of you, your son Mike, and Steve. I'm glad the light was not finished--that way we can see you again. Your a great business man and more importantly a great and kind man. Thank-you again today for what you did to fix a tough situation! Nita is still at 9:30 PM setting up her new bathroom--she's enjoying putting things away and decorating. It gives me great joy to see her pleased! May God bless you in a mighty way!" 5★★★★★ - "Charlie, I want to thank you so much for coming out to my home and explaining to me about the walk in tubs that you provide folks. I did not know which way to go and I felt like that I couldn't afford one. I checked with other companies and they were simply outrageous with their prices. I thought all tubs were priced that high but when you told me your price I knew there was hope. I really enjoy the tub, the warm water feels so good and it helps me relax because of my condition at 80. Also, the boys Charlie Jr and Mike were so nice and a pleasure to have in my home and done a great job installing the tub in. I will be recommending your services to my friends in the future. 5★★★★★ - "Dream Baths of Alabama installed a shower for me after removing a tub/shower unit. They did a wonderful job and finished when they said they would. They are the nicest people to work with. They kept the dust to a minimum and kept all their supplies contained in the bathroom and hallway. I was not disturbed at all with the demolition and the installation of the new shower. I really love the look of the shower. My friends and family who have seen it, love it like I do. I would highly recommend them to anyone. They are good people and do good work. I am very please with Dream Baths." 5★★★★★ - "On July 1, 2011, Dream Bath installed a new shower which included the walls, floor, soap dish, and grab bars. I was very pleased with the work performed by Charlie Thornton and his people. In November 2017, I discovered water under the floor of the shower. I called Mr. Thornton with Dream Bath. He came out promptly to check on the problem and fixed the shower floor to my satisfaction. His son, also named Charlie, was eager to do his best in completing the required work. I am very pleased with the work done by Dream Bath." 5★★★★★ - "We are pleased with our bathroom renovation by Dream Baths of Alabama. The walk-in shower is an amazing change for us. The work quality exceeded our expectations. I have more than 40 years of experience work with contractors and Dream Baths of Alabama is among the top of the list. Dream Baths of Alabama is first concerned with their client's needs based on face-to-face discussions with Charlie Thornton who can take what you say you want and comes back with a plan you need. Very dependable and courteous work teams." 5★★★★★ - "We had Dream Baths of Alabama convert our old one-piece shower/tub to a nice New larger shower only. We could not be happier. They used better quality materials than competitors. They did fast but quality work. I highly recommend Charlie Thornton and his company." 5★★★★★ - "Charlie and Mike make a highly efficient, professional, considerate, dependable, and pleasant crew." 5★★★★★ - "Doug and I are very pleased with the install in our two bathrooms. even though our bathrooms are small the enclosures make the rooms look larger. the acrylic tub to shower conversion and the tub/acrylic enclosure look even better than we imagined. Charlie and Mike were great! Dream Baths of Alabama is the complete package for bathroom remodeling." 5★★★★★ - "Dream Baths of Alabama, (Charlie Thornton Sr.) did a fantastic job on our shower conversion, Thanks guys!!!!" 5★★★★★ - "Charlie, thank you so much for the time your guys spent getting our bathroom fixed for my mother to be able to use this week. Your suggestion to convert from a tub shower set up to a low profile shower so that my mom could get in and out easy and I would not risk her getting hurt or myself was the best idea by far. Charlie Jr. did a great job and my family and I are excited to know that mom can take a bath with ease now. It looks BEAUTIFUL and THANK YOU and your CREW SO MUCH. L Paddmore"
5★★★★★ - "Charlie and his guys from Dream Baths came in and really delivered when it came to remodeling our bathroom, it looks beautiful . The work was done in a timely manner and very professionally done . Thanks so much, and we are glad that we contacted Charlie at Dream Baths"
5★★★★★ - "We had a great experience working with Dream Baths . Charlie, the owner, was very pleasant and not pushy at all; matter of fact ,we really had a good time when he came to our home. We talked about several things other than the bathroom we needed looking at. The young men, Josh and Charlie Jr., were just super to work with and done a very professional job. It was a very good experience and the cost was nothing compared to others in our area. We would recommend them to anyone . Thanks Guys"
5★★★★★ - "Jennifer is thrilled with Katie's new shower. Katie is at Camp Asca, a camp for special needs children and adults, so she hasn't seen it yet. Camp Asca is operated by Easter Seals. Such a treat for HC individuals located in Jackson Gap, Ala. Thank you guys for your great work. You have been so easy to work with." 5★★★★★ - "Thank you Charlie. It was a pleasure doing business with Dream Baths of Alabama. Now to get our home back in order so we can enjoy the renovations." 5★★★★★ - "Charlie, thank you for the work your boys done in my bathroom. I know my shower now I feel safe taking a bath. I am so glad I met you." Just wanted to thank you and your son for coming up today and repairing our shower stall for my Mom. I know it was a long way to come. It shows me you stand behind what you sell and that you are a man of integrity. It seems to me that those qualities, in this day and age, are becoming rarer and rarer. Again, thank you. 5★★★★★ - "Mr. Charlie Thornton of Dream Baths, son Charlie, Jr. and Josh completed demolition and remodel of my granddaughter's handicapped shower in two weeks. Very nice to work with. Charlie, Jr. and Josh did a great job. Very pleased with the outcome. I recommend Dream Bath highly." 5★★★★★ - "Jennifer is thrilled with Katie's new shower. Katie is at Camp Asca, a camp for special needs children and adults, so she hasn't seen it yet. Camp Asca is operated by Easter Seals. Such a treat for HC individuals located in Jackson Gap, Ala. Thank you for your guys' great work. You have been so easy to work with." We were very pleased with the job. The guys were both great, very respectful. They work really hard. I appreciate the fact that they did not leave a mess outside in front of the house. Every night their things were locked in the trailer, all garbage bagged and placed in the truck. The finished bathroom was vacuumed so most of the dust was gone. We haven't used the shower yet, but we will let you know if we encounter any problem...I'm sure we won't! I do apologize for all the trouble getting the border here and then we chose not to use it! You have two great guys working for you. We will certainly give you a good recommendation. 5★★★★★ - "Charlie & Crew - Thank you all for the Beautiful shower. We love it & show it off like we would a new grandbaby. Money well spent." 5★★★★★ - "The guys at Dream Baths of Alabama are very professional. They were extremely accommodating to our daily routines while they worked around us. The guys always cleaned up after each days work. Extremely trustworthy while we were gone! The bathroom turned out better than we ever expected! Enjoyed getting to know Josh and his team over the week they spent at our house. I would recommend them to anyone looking for an A+ bathroom remodel. 5/5 stars!" 5★★★★★ - "We are very pleased with the results of the renovation and look forward to enjoying it in the future. I want to compliment you on your construction crew for their skill and desire to satisfy their customer. I was especially impressed with Josh Smyth. He is very skilled and very easy to work with. You are lucky to have an associate like him." 5★★★★★ - "The employees of Dream Bath and its owner certainly went above and beyond the normal. their work is superb and they do not leave a mess when finished. I would recommend Dream Baths for any bathroom work you need done.."
5★★★★★ - "Hi Charlie, I just wanted you to know how much I am enjoying my new spa tub. It's absolutely wonderful! Your men and you did a great job and I appreciate the clean up as well. I have a disability, but anyone would love this after a long day!" 5★★★★★ - "My experience with Dream Baths was better than I anticipated. Charlie and his crew was outstanding....We had both bathrooms completely remodeled and we're completely satisfied from start to finish and will definitely recommend Dream Baths of Alabama to all our family,friends and neighbors." 5★★★★★ - "Dream Baths of Alabama was an enjoyable experience from the day we met with Charlie until the work was finished. Dream Baths is a professional, customer friendly business with experienced crew who obviously take pride in their work. Our new shower is beautiful and the closet created from our old shower is great." 5★★★★★ - "Excellent work on my daughter's bathroom. Professional ability to assess bathroom problems: behind the wall leak, floor not level, lack of insulation. All of the mention challenges were repaired at no additional cost. Mr. Josh was very professional and informative about his work and when he was leaving and returning. A difficult project with a bad floor that was completed in a timely manner." 5★★★★★ - "I love my step-in-bath. It is my personal hot tub. Charlie provided an excellent product, with excellent customer service. Above all, he has provided follow up with my questions and cares about his customers as much as his product and service. I highly recommend Dream Baths of Alabama." 5★★★★★ - "Came to our home and installed a tub to shower conversions and did a beautiful job, very professional. They cleaned up and it was ready to use the very next day. I would recommend them any day and we saved 1200.00 by not going with New Bath. Very precise, detailed, and meticulous. One of the most honest and trustworthy guys in the business. I would recommend them to anyone. Very satisfied." them. Their work is top notch and they were a joy to work with. Charlie was able to incorporate everything I wanted at a very fair price. I'd definitely use them again. My new Master Bathroom is EXACTLY how I wanted it!" 5★★★★★ - "Charlie Thorton of Dream Baths is an excellent respresentative of Bliss Tubs and a wonderful representative to talk with about any issues! Thank you Charlie!" 5★★★★★ - "Charlie and crew were the best. I would happily recommend them to anyone needing a new bath. They are honest, reliable, and very friendly." 5★★★★★ - "Professional service from the owner down to each employee was superb. I would recommend and will also use again in the future. Loving my master bath." 5★★★★★ - "It went well, the team of Josh and Charlie Jr. are detail oriented craftsmen; they know what they are doing and it shows in their work. They answered all of our questions as the job went along and were on time everyday and left in a timely manner every evening. I have to be honest. I was not prepared for the dust. (they were a careful as could be, but it made dust) If I had to do it over again, I would have covered everything with old sheets , etc. but it was still worth it. I would use then again if they did other types of projects. Highly satisfied with everything. Thanks to Josh and Charlie Jr. for a fantastic job." 5★★★★★ - "Charlie quickly contacted us after our online purchase and set up a date to meet at our house. He was right on time and had plenty of literature and material samples available for ideas and discussion. We went to our Master Bathroom and discussed ways to update it since no significant changes had been made since the house was built in 1990. The consultation helped us start off this project right, because, while we knew the bathroom needed renovation, we did not have the experience to see what types of changes or updates were doable and/or cost-effective. Overall, the consultation was great value for the money and Charlie did a thorough job, showing alternatives to improve all areas of the bathroom. It broadened our understanding of the options available for this renovation, preparing us to properly evaluate the multiple proposals/quotes we requested for the project." 5★★★★★ - "Dream Bath made my bathroom look like a Dream Bath! I love it! They removed the old tub, toilet, vanity, and damaged areas. They replaced the tub with a beautiful tub (my favorite part), toilet, vanity, and re-painted walls. It took a week to finish. The workers were professional and made me feel comfortable. They assisted me and kept me updated every step of the way. I can't wait to have my second bathroom redone. Thanks guys and May God Bless You!" 5★★★★★ - "Dream Baths replaced the bathtub/shower in our master bedroom. Half of the cost down and the remainder when the job was finished. While it took a while for Dream Baths to get the materials and work us into their schedule, we are very satisfied with the results. Very professional installation and clean up, all in one day. In fact, we are so pleased with the results that we are having them replace the guest bath too." 5★★★★★ - "My husband and I are very pleased with the final result of our master bathroom renovation. I think it will be a key selling point when we do decide to sell our home. The journey to get there was a bit bumpy, with several delays on getting the project started. Granted these delays were out of DBoA's control (increased national demand from one of their suppliers so there was a delay in getting parts), we just wish they were more up front on the reason for the delays in the beginning. Once DBoA was able to get their parts from their vendor things went very fast and very well. The construction employees of Dream Baths of Alabama are very professional and courteous. My husband and I cannot speak highly enough about those two men (both personally and professionally). DBoA showed great workmanship at an affordable price (several thousand dollars cheaper than another general contractor that we looked into, and better quality based on the jobs we did have them do). They took their time to clean up the place after the job was done. The employees were very accommodating with us making a couple of last minute changes and getting them implemented. Even with the bumps in the road, because of the great quality of the final result we would recommend Dream Baths of Alabama for bathroom renovations. NOTE ON COST: The cost we listed also includes (as the contractor we turned down put it) the pretties, which included the vanity, faucets, light fixtures, flooring, and paint. What DBoA included that the other contractor did not was the shower raw materials, and toilet." 5★★★★★ - "The Gentlemen of Dream baths of Alabama did a great job. The first day they methodically demolished and removed the old bathroom completely. It will create a lot of dust as with any remodel, so cover anything in that area you want to stay clean and close as many doors as possible. The men replaced all of the plumbing supply lines and drain lines. They installed a new acrylic surround with an overhead light, showerhead, spigot, and controls, sliding tub doors, and a new high-rise commode. My husband and I had previously purchased a vanity with faucet, mirror, and light, towel bars, and toilet paper holder.The men installed all of these items for us. They also installed a new tile floor and baseboard. The whole bathroom received a fresh coat of paint, that we supplied, on top of everything else they did. My husband and I are very pleased with the quality and particularly they attention to detail that our crew from Dream Baths provided. Thank you Charlie, Josh, and Steve for your professionalism. We love our new Bathroom it is worth every dime we spent." 5★★★★★ - "They took extra care to lay drop cloths all through the house and cleaned up the dust. I'm very happy." 5★★★★★ - "It was great! We had used them in January to do the downstairs bathroom, and were so pleased with every aspect of their work, professionalism, and quality of service, we wouldn't have dreamed (ha ha! get it!) of using anyone else! We did this bathroom in different colors than the first, and added a few other features (like wainscoting) and it turned out BEAUTIFUL! I honestly can't decide which bathroom I like better! They both have a different feel to them, but I am glad this is the one I get to use every day!! The old bathroom had awful 2 square PINK tiles all over the tub walls, floor, and walls! It was UGLY! We went with the grey marble look for the tub enclosure, and I love how it is all one piece, including the ceiling, with a nice sized cut out shelf for my shampoo. They replaced my tub (which was old, chipped, and stained), and gave me the awesome shower head I had fallen in love with from the other bathroom!! (the old shower head was all one piece with the pipe, and couldn't be easily replaced). In this bathroom, we wanted wainscoting which was perfect since there was all that ugly pink tile going halfway up the walls! They were able to just demo what was necessary, and put the wainscoting over it, which saved us big bucks and reinforced the walls! The toilet we got is so nice! I like to recycle, reuse and not be wasteful, and the toilet they gave us has two buttons on top to flush! One for light flushing, and the other for heavy flushing!! It is cool! Everyone comments on it when we show off the bathroom! We also picked out some beautiful ceramic tile for the floors, that look like antique wood planks, and found a nice vanity, light and mirror that they installed for us. (My husband custom made the counter top you see in the photos) They painted the walls and celling, and even added an outlet for us! Now not only is my bathroom absolutely beautiful, but much more practical!!" 5★★★★★ - "We cannot recommend Dream Baths and Charlie Thornton highly enough! We had a bathroom that had been all but non-functional for seven years because of a water issue. We needed a complete remodel. Before we talked to Charlie, the estimates we received from three other contractors were astronomical. We were so discouraged. Charlie's team did fantastic work within a budget that we could afford. We now have a beautiful bathroom. It is everything we wanted. The team, primarily Charlie, Jr. and Josh, was punctual and so polite. They worked very hard to finish in a timely manner and always cleaned up after themselves. The quality of the work is excellent. We would definitely use Dream Baths again. If you are losing hope that you can afford to redo your bathroom, call Charlie!" 5★★★★★ - "I am very happy with the service provided by Dream Baths. Mr. Thornton met me at my house at the agreed upon time and went over all the details about the service and helped me to pick out exactly what I wanted. The timing was very important. The work had to be done by Christmas. Mr. Thornton guaranteed it would be and he kept his promise. He called several times to let me know just exactly where they were in their schedule and when they would be able to come to my house. I was surprised by the cost, but I guess any renovation is not cheap and you do get want you pay for. The work is exceptional. It looked as if the bathroom was originally constructed that way. You cannot tell that any construction has been done. Everything was done to my specifications. The workers were not told that I wanted the plumbing reversed, but after verifying this with Mr. Thornton, they started over and did it exactly the way I wanted it done.The two men who worked on the bathroom were very professional. I would highly recommend Dream Baths." 5★★★★★ - "While I am in the process of remodeling the entire house this easily went from an eyesore into the best looking room in the house. The Dream Baths crew was very well organized and completed the job very quickly. I waited for the newness to wear off before I wrote the review and can still say i am highly please with the job and services rendered. I will add my voice to the others that highly recommend Charlie and the rest of the Dream Baths crew if you need bathroom remodeling work performed." "Started out as a simple bathroom renovation on a 45 year old bathroom. After discussion with Charlie the project morphed into a complete renovation of 2 bathrooms. We got Dream Baths business card from a friend who got it from the owners wife when they had a casual chat in the meat dept at Walt-Mart. Dream Baths was our first interview for the job. We originally planned to contact several other firms but after showing Mr Thornton what we wanted done and listening to his ideas and proposal, we knew he was the man we needed. Mr Thornton juggled his schedule around our travel and entertainment plans so it was a month before any work actually started. he kept us informed of all the products and when they would arrive and always was available to answer any questions we had.The work crew was wonderful-polite, caring, hard-working and clean! If any question came up they would always address them and ask us how we would like them to do it. This was not an easy job to do. Our house is old but each time a question arose the guys knew what to do and it was fixed. The crew laid down drop clothes to cover our flooring each morning and took it up each night before they left. They swept up each day and dusted off the furniture. When the project was finished we had little to no cleaning to do and that was great. When it came to settling up for the work. I had projected at least 500 to 1,000 for extra work done. NOPE- Mr Thornton said that there was no charge for the extras. We only paid what was originally agreed upon in the beginning. I have never had dealings with a company that went this well ever before. these guys deliver the goods and are just good people . I would recommend them to anybody and our 2 bathrooms are looking fantastic thanks to them." 5★★★★★ - "We moved into an older home recently and needed some advice on what would be best for the bathrooms. I called Charlie at Dream Baths and he graciously explained his ideas to me. He spent an hour or more just listening and giving me ideas and tips on how to do the work and save money. He was very kind man with integrity. A valued trade we don't always encounter. He is easy to talk to and I will keep his number for future reference and work." 5★★★★★ - "Every step of the process was great! They were very open to our opinions, and helping us get what we wanted, balanced with providing us all the information and options needed to make our choices. Charlie and Josh were very nice and professional, and went above and beyond to make the bathroom look great! My husband liked them so much we bought their lunch a few times. I like how we were able to pick our own vanity, and lighting fixtures that they installed to keep the cost down and get exactly what we wanted. So many things look different in person, I like to see the real thing. Speaking of, during the early stages when we picked out the materials for the shower walls, they had lots of samples to choose from, and we love the style we chose. The work took a few days longer than expected, but while watching the progress, we knew it was because they were doing everything right to fix the bathroom the way it needed to be done, so that wasn't an issue at all. It took about 7 business days to complete. They worked hard, kept the areas clean, and were very respectful of us and our home. I was about 12 months at the time (jk) and they even volunteered to work that Saturday to finish the work before the baby came, since that Monday had been a holiday (good thing too because the baby came that weekend). This reno was on our downstairs guest bathroom, and I loved it so much, I haven't showered upstairs since I came home from the hospital. It looks great! They used high quality materials, and were a pleasure to work with! Because of how well this bathroom turned out, we are now going to redo the upstairs bath. I can't wait! (and who says that about home renovations) I am definitely doing work with them again, and would recommend them, as I have, to anyone who is in need of a new bathroom." 5★★★★★ - "Crew was polite, professional, efficient." 5★★★★★ - "Excellent. They did a beautiful job. The workers were professional and clean." 5★★★★★ - "Charlie thank you for the beautiful shower your guy's installed for me. Just like the walk in last year for mom you guy's are good at what you do and thank you for that. I know people can trust what you tell them and when you say it is going to look a certain way it does. Thanks' again Brother." 5★★★★★ - "Charlie, S Jones here I wanted you to know that my girl friends really love my bath room since you guy's got your hand's on it. What I like are the color's and how the Acrylic look's just like Alabaster Marble one of my girl friends ask me how much it cost and I told her she really did not want to know but you know me I told her and she could not believe it and she said she was going to be giving you a call very soon. I love it Charlie." 5★★★★★ - "Charlie, I love my new walk in Tub! I use it EVERY night before I go to bed it makes my old back and leg's feel so much better and I can sleep much better at night. It relieves cramps in my calf muscle's which you know I told you I have suffered with for a long time. This tub is a GOD send for me if you need me to be a reference for you and the boy's just call me anytime. I really wished I had done this year's ago. God Bless you guy's." 5★★★★★ - "Hey Charlie, Man we want to thank you guy's for this lovely Bathroom Josh and Charlie Jr. installed for us. Hey I thank we done a real good job also picking out color's my girl friend love's it and man that take's a lot off my mind. I would recommend you guy's to anyone in my family or friend's." 5★★★★★ - "Dream Dream Bath's, Thank you for the help with our bathroom problem's. We never thought that we could do what you guy's did for us. It change everything in there. It is truly a totally different Bath Room now and me and my mother are tickled pink over it. " 5★★★★★ - "Charlie, Thank you for everything you and your guy's done for me in my bath room. I now feel like I am safer when I take a shower I am not afraid to use it by myself and I really enjoyed your guy's while they were here working." 5★★★★★ - "Thank you for the real interest you and your crew showed to me and my wife as far as helping us with our bath need's . It's going to make it so much easier for my wife to take a shower now and it look's beautiful." 5★★★★★ - "Hi Steven. I have wanted to email for some time now to let you know that Charlie is an extremely helpful and pleasant individual and went more than the extra mile to help us Him and his crew are a true asset, advocate and representative for Ella's Tubs. His crew was efficient and they all worked straight through the day until the job was completed. They cleaned up everything and toted away the old insert for disposal. If I had to rate them (which I am doing now) they would be 5 out of 5 star's and 2 thumb's up." 5★★★★★ - "Charlie your crew is the best. The shower and walk-in tub they installed looks beautiful I never thought the colors really would look so good. Thank you." 5★★★★★ - "Hi Charlie, I visited with Ms. Austin this morning and saw her tub WOW it looked great. We had a delightful visit and became instant friends- thanks to dream baths! So I'm ready to order my tub I cannot wait to be able to use it."